Arles, a UNESCO World Heritage site, is located along the Rhone river, where the Petite Rhone breaks off to the west on its way to the sea. 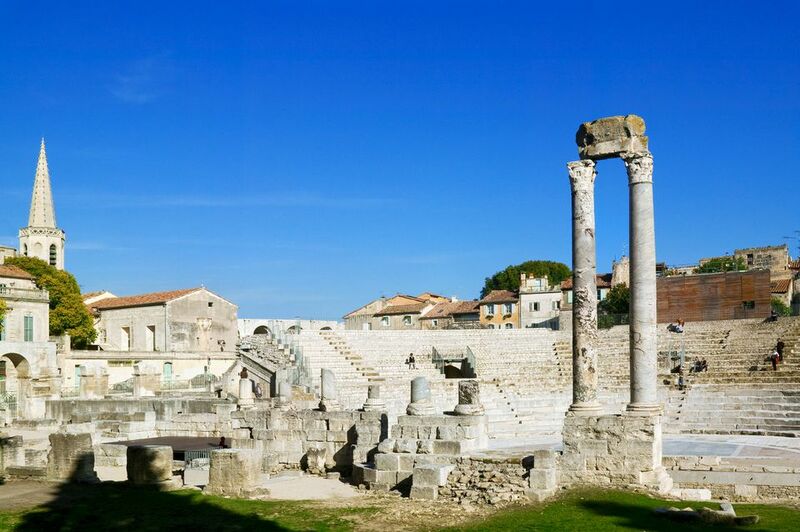 Arles dates back to the 7th century BC when it was the Phoenician town of Theline, and its Gallo-Roman heritage is seen in the ruins which are incorporated into the houses and buildings of the city. Vincent Van Gogh's arrival at the Arles railroad station on the 21st of February 1888 signaled the beginning of Arles and Provence as an artist's retreat. Many of the things and places he painted can still be seen, especially in Arles and the area surrounding St. Rémy de Provence. The Arles train station is on Avenue Paulin Talabot, about a ten minute walk from the center of town (see a map of Arles). There is a small tourist bureau and car rental available. Trains connect Arles and Avignon (20 minutes), Marseille (50 minutes) and Nîmes (20 minutes). The TGV from Paris connects to Avignon. Book a Ticket to Arles. The main bus station is located on Boulevard de Lices in the center of Arles. There is also a bus station opposite the train station. There are senior discounts available on bus tickets; inquire. Hotel Spa Le Calendal is steps away from the Amphitheatre and has a nice garden. Since Arles is set in a spectacular setting, and has a train station to get you around Provence, you might want to settle in for a while in a vacation rental. HomeAway has many to choose from, inside Arles and in the countryside: Arles Vacation Rentals. Arles is hot and dry in the summer, with the least rain coming in July. May and June offer ideal temperatures. the Mistral winds blow hardest in spring and winter. There's a good chance of rain in September, but September and October temperatures are ideal. Laverie Automatique Lincoln rue de la Cavalerie, by the Portes de la Cavalerie in the north end. Arles is known not only for impressionistic painting, but for photograpy as well. Arles is home to L'Ecole Nationale Supérieure de la Photographie (ENSP), the only university-level national photography school in France. Epic Film Festival - The Roman Theater at Arles stages a series of outdoor screenings of Hollywood epics in August, known locally as Le Festival Peplum. Camargue Gourmande a Arles--Arles hosts a Gourmet festival in September, with products from the Carmargue. Perhaps the top attraction in Arles is the Arles Amphitheatre (Arènes d'Arles). Built in the first century, it seats about 25,000 people and is the venue for bullfights and other festivals. TripSavvy trusts its readers to make their own decisions on the ethics of bullfighting as an attraction. Only two columns remain of the original Roman theater on the Rue de la Calade, the theater serves as a concert stage for festivals like the Recontres Internationales de la Photographie (Photography Festival). Museon Arlaten (history museum), 29 rue de la Republique Arles - Find out about life in Provence at the turn of the century. Musee de l'Arles et de la Provence antique (art and history), Presqu'ile du Cirque Romain Arles 13635 - see the ancient origins of Provence, starting at 2500 bc to the "end of Antiquity" in the 6th century. Near the Rhone, the Baths of Constantine were constructed in the fourth century. You can weave through the hot rooms and pools and check out the hot air ventilation circulating through tubuli (hollow tiles) and underfloor stacks of bricks (hypocausts). Arles has the biggest market in Provence on Saturday mornings.